A comedy romance loaded with biting satire of Los Angeles life, L.A. Story hits most of its intended targets, but also chooses ridiculously easy targets to aim at. Harris Telemacher (Steve Martin) is the wacky weatherman on a Los Angeles television station. He is in a rocky relationship with girlfriend Trudi (Marilu Henner), but they break up when he discovers her sleeping with his agent. Harris slips into a lonely funk, but then meets British journalist Sara (Victoria Tennant), and they start to fall in love. A freeway changeable message sign starts to communicate with Harris, providing him with advice on love and life, and urging him to take risks. But Sara's ex-husband Roland (Richard E. Grant ) would like to win her back, while Harris finds himself irresistibly attracted to young salesgirl Sandee (Sarah Jessica Parker). Written by Martin and directed by Mick Jackson, L.A. Story's primary objective is to make as much fun of Los Angeles as possible. And all the usual topics that are worth poking are here: the predictable and rarely changing weather, the obsession with driving for even the shortest trips, gun violence on the highways, California cuisine, plastic surgery, inane topics of conversation, earthquakes, and the trendy restaurants that are impossible for normal people to get into. Martin packs his story with deserved digs at his city, and generates a steady stream of laughs. But beyond the broad satire, the rest of the film is thin on the ground. 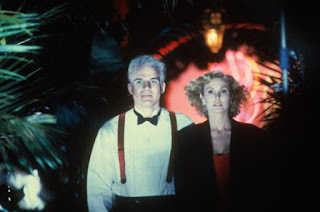 Victoria Tennant was Mrs. Steve Martin at the time of filming, and there is a whiff of a personal project about the movie. Martin attempts to elevate the central romance to something mystical, complete with a freeway sign that provides oblique life advice and a sojourn into a fantasy garden where everything old is new again. It's all rather emotionally obvious, and the film starts to resemble a couple's photo collection, special to them but ordinary to others. A sideshow running gag involving Harris being filmed rollerblading through museums and art galleries misses the mark and goes nowhere. The other romantic comedy elements are lined up and knocked off according to the genre's well- established traditions, Harris and Sara both lonely and struggling to fit in, falling for each other, and then labouring to overcome the usual complications of lingering past and present attachments. The supporting characters offer little that is memorable, with one exception. The best performance by far is delivered by Sarah Jessica Parker, who creates in Sandee a free-spirited, carefree young woman who can never stop twirling, bouncing, rotating and climbing all over Harris, all while incessantly chewing gum. Amidst all the satire, Sandee is Los Angeles, young, alive, positive, adventurous, incapable of standing still, and often clueless.